The Co-space project (2003-2006) was concerned with how novel interactive surfaces can be designed and used by co-located groups to enhance collaboration and interaction with digital information and physical artefacts. A goal was to facilitate more equitable participation in co-located meetings by exploring how best to support the diversity of interactions that take place in these new kinds of co-spaces. Research was conducted investigating both (i) the processes of management and collaboration in person-technology interactions and (ii) processes of visualizing, manipulating, comparing and integrating information. We found tabletop surfaces to be most effective at facilitating group decision-making and planning tasks. 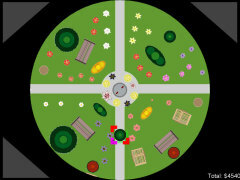 A number of applications were developed including photo sharing and physical layout design. We also looked at how to extend the tabletop surface by combining it with tangibles (tagged physical artifacts). Compared with digital representations, they are better at acting as thinking props, embodiments of abstract concepts and as communication media, commanding attention to show a principle or idea. The aim was to provide a mix of physical and digital representations that people could switch effortlessly between to support different stages of a collaborative activity. Let shy people talk with their fingers In another experiment, we compared how groups collaborated when using (i) only a laptop, (ii) a tabletop and (ii) a tabletop plus tangibles distributed throughout a room. Our findings showed marked differences between the contributions made by the different group members across the three conditions. The most talk was found to take place in the laptop condition that tended to be dominated by one person. The most equal participation was found to be in the tabletop plus tangibles condition: group members who were inherently shy or non-native speakers, were found to contribute much more to the physical design aspects of the task than those who did the talking. The project follows on from the eSpace and the Dynamo projects. This video shows some of the research results. Rogers, Y. Hazlewood, W., Blevis, E. and Lim, Y. 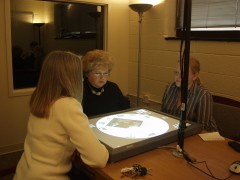 (2004) Finger talk: collaborative decision-making using talk and fingertip interaction around a tabletop display. In Proc. CHI’2004, ACM. 1271-1274. Rogers, Y. and Rodden, T. (2003) Configuring spaces and surfaces to support collaborative interactions. In O’Hara, K., Perry, M., Churchill, E. and Russell, D. (eds.) Public and Situated Displays, Kluwer Publishers. Rodden, T., Rogers, Y., Halloran, J., and Taylor, I. (2003) Designing novel interactional workspaces to support face-to-face consultations. In Proc of CHI’03. ACM. 57-64.